As anyone who operates a gravel road recognizes, dust is an often difficult problem that can impact surrounding communities, plant and animal life, and driver safety. Road fines kicked up by vehicles or windy weather create poor visibility on the road, make it difficult for plants to absorb sunlight, and coat nearby houses and equipment in a thick layer of dust. These problems are common in Central Pennsylvania, where rural communities are often connected to parkways and freeways by unpaved roads. Many of these unpaved roads are located near streams, meaning that loose surface aggregate can easily be washed into aquatic ecosystems by rain and snow. These environmental health and safety issues prompted the Center for Dirt and Gravel Road Studies to commission a study comparing two of the most common surface aggregate specifications. The study hoped to find which of the aggregates produced lower volumes of fugitive dust on average. The comparison is certainly an important one, as the people of Central Pennsylvania should be doing everything they can to ensure the gravel roads they use are both safe for people to use and friendly to surrounding ecosystems. But regardless of the aggregate used to construct unpaved roads, effective dust control is needed to keep them strong and environmentally safe. The two specifications reviewed by the study are the Driving Surface Aggregate spec (DSA) and the Pennsylvania Department of Transportation 2A spec (PennDOT 2A). While DSA was designed to be a wear course for unpaved roads, PennDOT 2A was originally developed as a porous material to lay between asphalt and the road base. Because PennDOT 2A is engineered to allow materials to sink in through the road surface and down into the foundation, it’s also commonly used as a surface aggregate in roads throughout Central Pennsylvania. DSA’s advantage is that it is designed for maximum compaction density, which theoretically produces roads that require less frequent maintenance. For the study, road material for both surface aggregates were collected from local limestone quarries. The study observed several gravel roads throughout Central Pennsylvania, all of them constructed at least three years ago, during both dry and stormy conditions. Practically all of the data these researchers collected indicated that DSA was more effective in suppressing dust created by vehicles — roads that used this specification saw anywhere from 50-90% less dust than what was produced by roads using PennDOT 2A. The report from the Center for Dirt and Gravel Road Studies proved just how important a tight specification is in constructing strong roads that don’t pollute the air and environment around them. But believe it or not, the aggregate used to build a gravel road is just one part of dust control: far more important is what you use to maintain it. 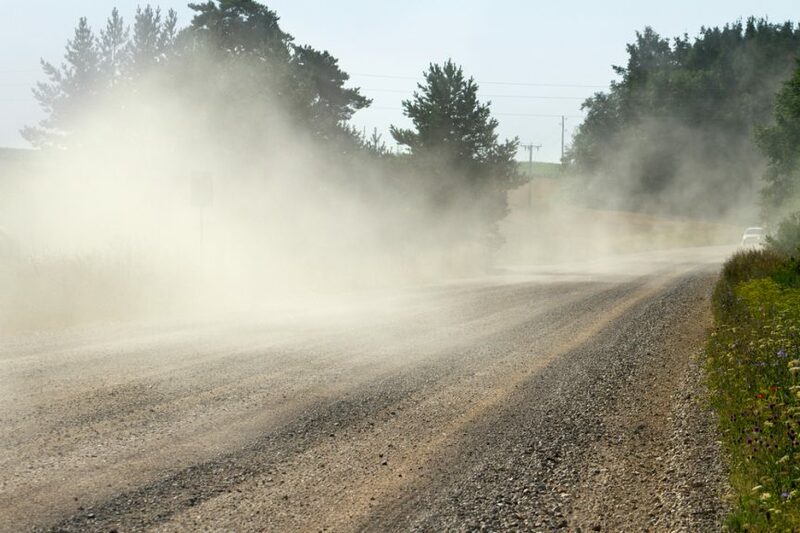 In fact, many of the problems associated with gravel roads — from airborne dust, to structural damage caused by weather, to airborne dust — can be mitigated or eliminated with the right dust control program. For instance, any dust control program that leverages Midwest Industrial Supply, Inc.’s patented technology and proven application plans will actually improve the quality of runoff, as well as protect against surface degradation, potholes, and washboarding. Most importantly, however, it will dramatically reduce the presence of PM10 and PM2.5 dust particles, all while extending the life-cycle of your road. Our environmentally friendly products and experienced technicians will build a dust control program that works with the soils already in-place in your roads, eliminating the need to haul in expensive outside aggregate. It’s key that the people of Central Pennsylvania and beyond are aware of the best material to use in the construction of gravel roads. But if we’re really dedicated to the work of reducing airborne dust and protecting the communities who live near these roads, we’ll have to invest in a future that goes well beyond construction.